Following the Lancaster House Agreement of 1979 there was a transition to internationally recognized majority rule in 1980; the United Kingdom ceremonially granted Zimbabwe independence on 18 April that year. In the 2000s Zimbabwe's economy began to deteriorate due to various factors, including, the imposition of economic sanctions by western countries led by the United Kingdom, and also due to wide spread corruption in government. Economic instability caused a lot of Zimbabweans to move overseas or to neighboring countries. Prior to its recognized independence as Zimbabwe in 1980, the nation had been known by several names: Rhodesia, Southern Rhodesia and Zimbabwe Rhodesia. Stoneage paintings by the San located near Murewa, Zimbabwe. The San or Saan peoples, also known as the Bushmen, are members of various Khoesān-speaking indigenous hunter-gatherer groups that are the first nations of Southern Africa, and whose territories span Botswana, Namibia, Angola, Zambia, Zimbabwe, Lesotho and South Africa. There is a significant linguistic difference between the northern peoples living between the Okavango River in Botswana and Etosha National Park in northwestern Namibia, extending up into southern Angola; the central peoples of most of Namibia and Botswana, extending into Zambia and Zimbabwe; and the southern people in the central Kalahari towards the Molopo River, who are the last remnant of the previously extensive indigenous Sān of South Africa. These Bantu speakers were the makers of early Iron Age pottery belonging to the Silver Leaves or Matola tradition, third to fifth centuries A.D.,  found in southeast Zimbabwe. This tradition was part of the eastern stream  of Bantu expansion (sometimes called Kwale)  which originated west of the Great Lakes, spreading to the coastal regions of southeastern Kenya and north eastern Tanzania, and then southwards to Mozambique, south eastern Zimbabwe and Natal. More substantial in numbers in Zimbabwe were the makers of the Ziwa and Gokomere ceramic wares, of the fourth century A.D.  Their early Iron Age ceramic tradition belonged to the highlands facies of the eastern stream,  which moved inland to Malawi and Zimbabwe. Imports of beads have been found at Gokomere and Ziwa sites, possibly in return for gold exported to the coast. Ziwa, or Ziwa ruins is the remains of a vast late Iron Age agricultural settlement that has been dated to the 15th century. The site is located in Nyanga, Zimbabwe. Ziwa was declared a National Monument in 1946 and is currently under consideration for World Heritage listing. The site contains a large variety of stonework structures including stone terraces running along contours of hills and steep landscapes. Archaeological investigations have also engendered important aspects of pottery and rock art. Although the western stream Kalundu tradition was ancestral to Shona ceramic wares, the closest relationships of the ancestral Shona language according to many linguists      were with a southern division of eastern Bantu – such languages as the southeastern languages (Nguni, Sotho-Tswana, Tsonga), Nyasa and Makwa. While it may well be the case that the people of the western stream spoke a language belonging to a wider Eastern Bantu division, it is a puzzle which remains to be resolved that they spoke a language most closely related to the languages just mentioned, all of which are today spoken in southeastern Africa. After the Shona speaking people moved into the present day Zimbabwe many different dialects developed over time in the different parts of the country. Among these was Kalanga. It is believed that Kalanga speaking societies first emerged in the middle Limpopo valley in the 9th century before moving on to the Zimbabwean highlands. The Zimbabwean plateau eventually became the centre of subsequent Kalanga states. The Kingdom of Mapungubwe was the first in a series of sophisticated trade states developed in Zimbabwe by the time of the first European explorers from Portugal. They traded in gold, ivory and copper for cloth and glass. From about 1250 until 1450, Mapungubwe was eclipsed by the Kingdom of Zimbabwe. This Kalanga state further refined and expanded upon Mapungubwe's stone architecture, which survives to this day at the ruins of the kingdom's capital of Great Zimbabwe. From circa 1450–1760, Zimbabwe gave way to the Kingdom of Mutapa. This Kalanga state ruled much of the area that is known as Zimbabwe today, and parts of central Mozambique. It is known by many names including the Mutapa Empire, also known as Mwenemutapa was known for its gold trade routes with Arabs and the Portuguese. However, Portuguese settlers destroyed the trade and began a series of wars which left the empire in near collapse in the early 17th century. As a direct response to Portuguese aggression in the interior, a new Kalanga state emerged called the Rozwi Empire. Relying on centuries of military, political and religious development, the Rozwi (which means "destroyers") removed the Portuguese from the Zimbabwe plateau by force of arms. The Rozwi continued the stone building traditions of the Zimbabwe and Mapungubwe kingdoms while adding guns to its arsenal and developing a professional army to protect its trade routes and conquests. Around 1821, the Zulu general Mzilikazi of the Khumalo clan successfully rebelled from King Shaka and created his own clan, the Ndebele. The Ndebele fought their way northwards into the Transvaal, leaving a trail of destruction in their wake and beginning an era of widespread devastation known as the Mfecane. When Dutch trekboers converged on the Transvaal in 1836, they drove the tribe even further northward. By 1838, the Rozwi Empire, along with the other Shona states had been unconquered by the Ndebele. After losing their remaining South African lands in 1840, Mzilikazi and his tribe permanently settled the southwest of present-day Zimbabwe in what became known as Matabeleland, establishing Bulawayo as their capital. Mzilikazi then organised his society into a military system with regimental kraals, similar to those of Shaka, which was stable enough to repel further Boer incursions. Mzilikazi died in 1868 and, following a violent power struggle, was succeeded by his son, Lobengula.King Mzilikazi had established the Ndebele Kingdom, with Shona subjects paying tribute to him. This Kingdom (Ndebele Kingdom) under King Lobengula faced the threat of colonialism and King Lobengula signed the treaties of occupation with the European imperialists that saw the occupation of the present Zimbabwe state. In the 1880s, the British arrived with Cecil Rhodes' British South Africa Company. In 1898, the name Southern Rhodesia was adopted. In 1888, British colonialist Cecil Rhodes obtained a concession for mining rights from King Lobengula of the Ndebele peoples. Cecil Rhodes presented this concession to persuade the government of the United Kingdom to grant a royal charter to his British South Africa Company (BSAC) over Matabeleland, and its subject states such as Mashonaland. Rhodes sought permission to negotiate similar concessions covering all territory between the Limpopo River and Lake Tanganyika, then known as 'Zambesia'. In accordance with the terms of aforementioned concessions and treaties,  Cecil Rhodes promoted the colonisation of the region's land, with British control over labour as well as precious metals and other mineral resources. In 1895 the BSAC adopted the name 'Rhodesia' for the territory of Zambesia, in honour of Cecil Rhodes. In 1898, 'Southern Rhodesia' became the official denotation for the region south of the Zambezi,  which later became Zimbabwe. The region to the north was administered separately by the BSAC and later named Northern Rhodesia (now Zambia). The Shona staged unsuccessful revolts (known as Chimurenga) against encroachment upon their lands, by clients of BSAC and Cecil Rhodes in 1896 and 1897. [ citation needed ] Following the failed insurrections of 1896–97 the Ndebele and Shona groups became subject to Rhodes's administration thus precipitating European settlement en masse which led to land distribution disproportionately favouring Europeans, displacing the Shona, Ndebele, and other indigenous peoples. Southern Rhodesia became a self-governing British colony in October 1923, subsequent to a referendum held the previous year. Many Rhodesians served on behalf of the United Kingdom during World War II, mainly in the East African Campaign against Axis forces in Italian East Africa. In 1953, in the face of African opposition,  Britain consolidated the two colonies of Rhodesia with Nyasaland (now Malawi) in the ill-fated Federation of Rhodesia and Nyasaland which was dominated by Southern Rhodesia. Growing African nationalism and general dissent, particularly in Nyasaland, persuaded the UK to dissolve the Union in 1963, forming three colonies. As colonial rule was ending throughout the continent and as African-majority governments assumed control in neighbouring Northern Rhodesia and in Nyasaland, the white-minority Rhodesian government led by Ian Smith made a Unilateral Declaration of Independence (UDI) from the United Kingdom on 11 November 1965. The United Kingdom deemed this an act of rebellion, but did not re-establish control by force. The white minority government declared itself a republic in 1970. A civil war ensued, with Joshua Nkomo's ZAPU and Robert Mugabe's ZANU using assistance from the governments of Zambia and Mozambique. Although Smith's declaration was not recognised by the United Kingdom nor any other foreign power, Southern Rhodesia dropped the designation "Southern", and claimed nation status as the Republic of Rhodesia in 1970   although this was not recognised internationally. Mugabe's government changed the capital's name from Salisbury to Harare on 18 April 1982 in celebration of the second anniversary of independence. The government renamed the main street in the capital, Jameson Avenue, in honour of Samora Machel, President of Mozambique. The new Constitution provided for an executive[ citation needed ] President as Head of State with a Prime Minister as Head of Government. Reverend Canaan Banana served as the first President. In government amended the Constitution in 1987 to provide for an Executive President and abolished the office of Prime Minister. The constitutional changes came into effect on 1 January 1988 with Robert Mugabe as President. The bicameral Parliament of Zimbabwe had a directly elected House of Assembly and an indirectly elected Senate, partly made up of tribal chiefs. The Constitution established two separate voters rolls, one for the black majority, who had 80% of the seats in Parliament, and the other for whites and other ethnic minorities, such as Coloureds, people of mixed race, and Asians, who held 20%. The government amended the Constitution in 1986, eliminating the voter rolls and replacing the white seats with seats filled by nominated members. Many white MPs joined ZANU which then reappointed them. In 1990 the government abolished the Senate and increased the House of Assembly's membership to include members nominated by the President. Because of the unsettled security situation immediately after independence and democratic sentiments, the government kept in force a "state of emergency". This gave the government widespread powers under the "Law and Order Maintenance Act," including the right to detain persons without charge which it used quite widely. In 1983 to 1984 the government declared a curfew in areas of Matabeleland and sent in the army in an attempt to suppress members of the Ndebele tribe. The pacification campaign, known as the Gukuruhundi, or strong wind, resulted in at least 20,000 civilian deaths perpetrated by an elite, North Korean-trained brigade, known in Zimbabwe as the Gukurahundi. ZANU-PF increased its majority in the 1985 elections, winning 67 of the 100 seats. The majority gave Mugabe the opportunity to start making changes to the constitution, including those with regard to land restoration. Fighting did not cease until Mugabe and Nkomo reached an agreement in December 1987 whereby ZAPU became part of ZANU-PF and the government changed the constitution to make Mugabe the country's first executive president and Nkomo one of two vice-presidents. Elections in March 1990 resulted in another overwhelming victory for Mugabe and his party, which won 117 of the 120 election seats. Election observers estimated voter turnout at only 54% and found the campaign neither free nor fair[ citation needed ], though balloting met international standards. Unsatisfied with a de facto one-party state, Mugabe called on the ZANU-PF Central Committee to support the creation of a de jure one-party state in September 1990 and lost. The government began further amending the constitution. The judiciary and human rights advocates fiercely criticised the first amendments enacted in April 1991 because they restored corporal and capital punishment and denied recourse to the courts in cases of compulsory purchase of land by the government. The general health of the civilian population also began to significantly flounder and by 1997 25% of the population of Zimbabwe had been infected by HIV, the AIDS virus. During the 1990s students, trade unionists, and workers often demonstrated to express their discontent with the government. Students protested in 1990 against proposals for an increase in government control of universities and again in 1991 and 1992 when they clashed with police. Trade unionists and workers also criticised the government during this time. In 1992 police prevented trade unionists from holding anti-government demonstrations. In 1994 widespread industrial unrest weakened the economy. In 1996 civil servants, nurses, and junior doctors went on strike over salary issues. Although many whites had left Zimbabwe after independence, mainly for neighbouring South Africa, those who remained continued to wield disproportionate control of some sectors of the economy, especially agriculture. In the late-1990s whites accounted for less than 1% of the population but owned 70% of arable land. Mugabe raised this issue of land ownership by white farmers. In a calculated move, he began forcible land redistribution, which brought the government into headlong conflict with the International Monetary Fund. Amid a severe drought in the region, the police and military were instructed not to stop the invasion of white-owned farms by the so-called 'war veterans' and youth militia. This has led to a mass migration of White Zimbabweans out of Zimbabwe. At present almost no arable land is in the possession of white farmers. The economy was run along corporatist lines with strict governmental controls on all aspects of the economy. Controls were placed on wages, prices and massive increases in government spending resulting in significant budget deficits. This experiment met with very mixed results and Zimbabwe fell further behind the first world and unemployment. Some market reforms in the 1990s were attempted. A 40 per cent devaluation of the Zimbabwean dollar was allowed to occur and price and wage controls were removed. These policies also failed at that time. Growth, employment, wages, and social service spending contracted sharply, inflation did not improve, the deficit remained well above target, and many industrial firms, notably in textiles and footwear, closed in response to increased competition and high real interest rates. The incidence of poverty in the country increased during this time. However, Zimbabwe began experiencing a period of considerable political and economic upheaval in 1999. Opposition to President Mugabe and the ZANU-PF government grew considerably after the mid-1990s in part due to worsening economic and human rights conditions brought about by crippling economic sanctions imposed by western countries led by Britain in response to land seizures from the White minority farmers. The Movement for Democratic Change (MDC) was established in September 1999 as an opposition party founded by trade unionist Morgan Tsvangirai. Parliamentary elections held in June 2000 were marred by localised violence, and claims of electoral irregularities and government intimidation of opposition supporters. [ citation needed ] Nonetheless, the MDC succeeded in capturing 57 of 120 seats in the National Assembly. Presidential elections were held in March 2002. In the months leading up to the poll, ZANU-PF, with the support of the army, security services, and especially the so-called 'war veterans', – very few of whom actually fought in the Second Chimurenga against the Smith regime in the 1970s – set about wholesale intimidation and suppression of the MDC-led opposition[ citation needed ]. Despite strong international criticism, these measures, together with organised subversion of the electoral process, ensured a Mugabe victory[ citation needed ] . The government's behaviour drew strong criticism from the EU and the USA, which imposed limited sanctions against the leading members of the Mugabe regime. Since the 2002 election, Zimbabwe has suffered further economic difficulty and growing political chaos. In August 2006 runaway inflation forced the government to replace its existing currency with a revalued one. In December 2006, ZANU-PF proposed the "harmonisation" of the parliamentary and presidential election schedules in 2010; the move was seen by the opposition as an excuse to extend Mugabe's term as president until 2010. The educational system in Zimbabwe which was once regarded as among the best in Africa, went into crisis in 2007 because of the country's economic meltdown. One foreign reporter witnessed hundreds of children at Hatcliffe Extension Primary School in Epworth, 12 miles west of Harare, writing in the dust on the floor because they had no exercise books or pencils. The high school exam system unravelled in 2007. Examiners refused to mark examination papers when they were offered just Z$79 a paper, enough to buy three small candies. Corruption has crept into the system and may explain why in January 2007 thousands of pupils received no marks for subjects they had entered, while others were deemed "excellent" in subjects they had not sat. However as of late the education system has recovered and is still considered the best in Southern Africa. 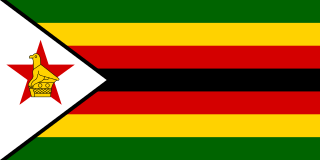 Zimbabwe held a presidential election along with a 2008 parliamentary election of 29 March. The three major candidates were incumbent President Robert Mugabe of the Zimbabwe African National Union – Patriotic Front (ZANU-PF), Morgan Tsvangirai of the Movement for Democratic Change – Tsvangirai (MDC-T), and Simba Makoni, an independent. As no candidate received an outright majority in the first round, a second round was held on 27 June 2008 between Tsvangirai (with 47.9% of the first round vote) and Mugabe (43.2%). Tsvangirai withdrew from the second round a week before it was scheduled to take place, citing violence against his party's supporters. The second round went ahead, despite widespread criticism, and led to victory for Mugabe. Because of Zimbabwe's dire economic situation the election was expected to provide President Mugabe with his toughest electoral challenge to date. Mugabe's opponents were critical of the handling of the electoral process, and the government was accused of planning to rig the election; Human Rights Watch said that the election was likely to be "deeply flawed". After the first round, but before the counting was completed, Jose Marcos Barrica, the head of the Southern African Development Community observer mission, described the election as "a peaceful and credible expression of the will of the people of Zimbabwe." No official results were announced for more than a month after the first round. The failure to release results was strongly criticised by the MDC, which unsuccessfully sought an order from the High Court to force their release. An independent projection placed Tsvangirai in the lead, but without the majority needed to avoid a second round. The MDC declared that Tsvangirai won a narrow majority in the first round and initially refused to participate in any second round. ZANU-PF has said that Mugabe will participate in a second round;  the party alleged that some electoral officials, in connection with the MDC, fraudulently reduced Mugabe's score, and as a result a recount was conducted. Preliminary talks to set up conditions for official negotiations began between leading negotiators from both parties on 10 July, and on 22 July, the three party leaders met for the first time in Harare to express their support for a negotiated settlement of disputes arising out of the presidential and parliamentary elections. Negotiations between the parties officially began on 25 July and are currently proceeding with very few details released from the negotiation teams in Pretoria, as coverage by the media is barred from the premises where the negotiations are taking place. The talks were mediated by South African President Thabo Mbeki. By 2016 the economy had collapsed, nationwide protests took place throughout the country  and the finance minister admitted "Right now we literally have nothing." There was the introduction of bond notes to literally fight the biting cash crisis and liquidity crunch. Cash became scarce on the market in the year 2017. In January 2019 following a 130% increase in the price of fuel thousands of Zimbabweans protested and the government responded with a coordinated crackdown that resulted in hundreds of arrests and multiple deaths. The politics of Zimbabwe takes place in a framework of a full presidential republic, whereby the President is the head of state and government as organized by the 2013 Constitution. Executive power is exercised by the government. Legislative power is vested in both the government and parliament. The status of Zimbabwean politics has been thrown into question by a 2017 coup. Gibson Jama Sibanda was a Zimbabwean politician and trade unionist. He was a founding member of the Movement for Democratic Change and at the time of his death was the Vice-President of the faction of the Movement for Democratic Change led by Arthur Mutambara. A former president of the Zimbabwe Congress of Trade Unions, he was first elected to the House of Assembly in the 2000 parliamentary election. He was a member of the Senate and a Minister of State in the Office of Deputy Prime Minister Arthur Mutambara at the time of his death in 2010. Arthur Guseni Oliver Mutambara is a Zimbabwean politician. He became the president of the Movement for Democratic Change (MDC) in February 2006. He has worked as a director and CEO of Africa Technology and Business Institute since September 2003. Under a September 2008 power-sharing agreement, Mutambara served in the government as one of two Deputy Prime Ministers from 2009 to 2013. Tendai Laxton Biti is a Zimbabwean politician who served as Zimbabwe's Minister of Finance from 2009 to 2013 and is the current Memberof Parliament for Harare East Constituency. He was the Secretary-General of the Movement for Democratic Change and the subsequent Movement for Democratic Change – Tsvangirai (MDC-T) political parties and a Member of Parliament for Harare East until he was expelled from the party and recalled from parliament in mid-2014,before winning the seat again in 2018. Nelson Chamisa is a Zimbabwean politician and former church pastor, current MDC Alliance President and former member of the House of Assembly of Zimbabwe for Kuwadzana, Harare. He became the Secretary for Information and Publicity for the opposition party Movement for Democratic Change (MDC), and former national youth chairperson for that party. Chamisa was the MDC Alliance's candidate for president in the 2018 general election. Campaigning for the first round of the presidential election held in Zimbabwe on 29 March 2008 took place from February to March. There were three major candidates: President Robert Mugabe of the ruling Zimbabwe African National Union - Patriotic Front (ZANU-PF), Morgan Tsvangirai of the opposition Movement for Democratic Change, and the independent candidate Simba Makoni. Zambian President Levy Mwanawasa called an emergency meeting of SADC leaders for 12 April during the 2008 Zimbabwe presidential election to discuss the post-election impasse. According to Mwanawasa, Zimbabwe's "deepening problems" meant that the issue needed to be "dealt with at presidential level". Jacob Zuma, meanwhile, said that he thought results should have already been announced, and he described the failure to release them as "unprecedented". The second round of voting in the Zimbabwean presidential election of 2008 was held between Robert Mugabe and Morgan Tsvangirai after the first round failed to produce a 50% majority for either candidate. The election process was marred by violence against and intimidation of voters and party workers, which eventually led to the withdrawal of Tsvangirai from the poll. This left Mugabe as the winner of, effectively, a one-candidate election. The 2008–2009 Zimbabwean political negotiations between the opposition Movement for Democratic Change, its small splinter group, the Movement for Democratic Change – Mutambara, and the ruling Zimbabwe African National Union – Patriotic Front were intended to negotiate an end to the partisan violence and human rights violations in Zimbabwe and create a framework for a power-sharing executive government between the two parties. These negotiations followed the 2008 presidential election, in which Mugabe was controversially re-elected, as well as the 2008 parliamentary election, in which the MDC won a majority in the House of Assembly. The Movement for Democratic Change – Tsvangirai (MDC–T) is a center-left political party and currently the main opposition party in the House of Assembly of Zimbabwe ahead of the 2018 elections. After the split of the original Movement for Democratic Change in 2005, the MDC–T remains the major opposition faction. The smaller faction is the Movement for Democratic Change – Ncube, or MDC–N, led by Welshman Ncube. 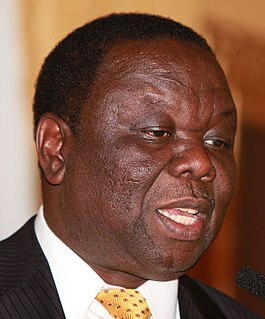 Morgan Richard Tsvangirai was a Zimbabwean politician who was Prime Minister of Zimbabwe from 2009 to 2013. He was President of the Movement for Democratic Change – Tsvangirai (MDC-T) and a key figure in the opposition to former President Robert Mugabe. General elections were held in Zimbabwe on 31 July 2013. The incumbent President, Robert Mugabe, was re-elected, whilst his ZANU–PF party won a two-thirds majority in the House of Assembly. ↑ "Pre-colonial history of SA". South African History Online. Retrieved 17 July 2016. ↑ Huffman, T.N. (2007). Handbook to the Iron Age. University of KwaZulu-Natal Press. p. 123. ↑ Phillipson, D.W. (1985). "An Archaeological Reconsideration of Bantu Expansion". Muntu. 2: 69–84. 1 2 Huffman. Handbook to the Iron Age. ↑ Phillipson, D.W. (1995). African Archaeology 3rd ed. Cambridge. pp. 250 ff. ↑ Phillipson, D.W. "An Archaeological Reconsideration of Bantu Expansion": 77–8. ↑ P. Mitchell; G. Whitelaw (2005). "The Archaeology of Southernmost Africa from c. 2000 bp to the Early 1800s: a Review of Recent Research". Journal of African History. 46: 209–241. doi:10.1017/s0021853705000770. ↑ Phillipson, D.W. (1989). Bantu-Speaking People in Southern Africa' in Obenga (ed), Les Peuples Bantu. Paris. p. 156. ↑ Mapungubwe: A Living Legacy. Mapungubwe Institute for Strategic Reflection. 2011. ↑ Phillipson (1989). Bantu-Speaking People in Southern Africa. p. 156. ↑ Phillipson, 1985. "An Archaeological Reconsideration of Bantu Expansion": 69–84. ↑ Ehret, C. (2001). An African Classical Age. University Press of Virginia. p. 239. ↑ Huffman (2007). Handbook to the Iron Age. ↑ Ehret. An African Classical Age. ↑ Bastin Y, Coupez A, Mann M (1999). "Continuity and divergence in the Bantu languages: perspectives from a lexicostatistic study". Annales, Sciences humaines. 162: 315–317 (the S languages). ↑ Guthrie, M. (1967–71). Comparative Bantu: an introduction to the comparative linguistics and prehistory of the Bantu languages. Gregg International. ↑ K. Rexová; Y. Bastin; D. Frynta (2006). "Cladistic analysis of Bantu Languages". Naturwissenschaften. 93: 189–194. doi:10.1007/s00114-006-0088-z. PMID 16514514. ↑ Holden, C.J. (2002). "Bantu language trees reflect the spread of farming across sub- Saharan Africa,". Proc. R. Soc. Lond. : 793–799. ↑ Hall, Martin; Stephen W. Silliman (2005). Historical Archaeology. Wiley Blackwell. pp. 241–244. ISBN 978-1-4051-0751-8. ↑ "So Who Was Shaka Zulu- Really?". The Odyssey. Retrieved 14 December 2008. ↑ Hensman, Howard. Cecil Rhodes: A Study of a Career. p. 106–107. ↑ Parsons, Neil. A New History of Southern Africa, Second Edition, 1993. London: Macmillan. pp. 178–181. ↑ Bryce, James. Impressions of South Africa. p. 170. ↑ Gray, J. A. (1956). "A Country in Search of a Name". The Northern Rhodesia Journal . III (1): 78. Retrieved 14 December 2008. ↑ Parsons (1993). p. 292. ↑ Judd, Denis. Empire: The British Imperial Experience from 1765 to the Present. p. 372. ↑ Parsons (1993). pp. 318–320. ↑ Williams, Lizzie (2005). Africa Overland. pp. 169–170. ↑ Pakenham, Thomas (1992). Scramble for Africa: White Man's Conquest of the Dark Continent from 1876 to 1912. p. 669. ↑ Abegunrin, Olayiwola (2003). Nigerian Foreign Policy Under Military Rule, 1966–1999. p. 89. ↑ Kalley, Jacqueline Audrey (1999). Southern African Political History: A Chronology of Key Political Events from Independence to Mid-1997. p. 711. 1 2 Kalley, Jacqueline Audrey (1999). Southern African Political History: A Chronology of Key Political Events from Independence to Mid-1997. p. 718. ↑ Raymond, Walter John. Dictionary of Politics: Selected American and Foreign Political and Legal Terms, 1992. Page 557. ↑ Kalley, Jacqueline Audrey. Southern African Political History: A chronological of key political events from independence to mid-1997, 1999. Page 711-712. ↑ "HISTORY OF ZIMBABWE". History World. 4 May 2007. ↑ "From Corporatism to Liberalization in Zimbabwe: Economic Policy Regimes and Political Crisis, 1980–97". International Political Science Review . 26 (1). 2005. pp. 91–106. ↑ "REPORT: Policing the State – an evaluation of 1,981 political arrests in Zimbabwe: 2000–2005". zimonline.co.za. 15 December 2006. Archived from the original on 28 September 2007. ↑ Wines, Michael (9 May 2007). "Opposition Splits While Zimbabwe Slips". The New York Times . Retrieved 4 May 2010. ↑ Sturcke, James (1 April 2005). "Mugabe's party wins Zimbabwe election". The Guardian . London. Retrieved 4 May 2010. 1 2 "Background Note: Zimbabwe". United States Department of State . ↑ Tisdall, Simon (8 November 2005). "Zimbabwe surrounded by sound and fury, but little action". The Guardian . London. Retrieved 4 May 2010. ↑ Meldrum, Andrew (29 September 2005). "Zimbabwe's economic crisis drives it back into steam age". The Guardian . London. Retrieved 4 May 2010. ↑ "Zimbabwe: End harassment, torture and intimidation of opposition activists" (PDF). Amnesty International . 28 March 2007. Archived from the original (PDF) on 13 November 2007. ↑ "Zimbabwe inflation 'incalculable'". London: BBC News. 27 November 2007. Retrieved 5 January 2010. ↑ Meldrum, Andrew (10 May 2007). "Zimbabweans face power cuts for up to 20 hours a day". The Guardian . London. Retrieved 4 May 2010. ↑ Wines, Michael (2 May 2007). "How Bad Is Inflation in Zimbabwe?". The New York Times . Retrieved 4 May 2010. ↑ "Corn Up Nearly 700 Percent in Zimbabwe". The Washington Post . 1 May 2007. Archived from the original on 4 November 2012. ↑ McGreal, Chris (1 October 2007). "Zimbabwe runs out of bread". The Guardian . London. Retrieved 4 May 2010. ↑ "Zimbabwe: Column – Mary Revesai". All Africa. 7 May 2007. ↑ "Trip to Africa enlightens". Contra Costa Times . 16 April 2007. ↑ McVeigh, Tracy (22 April 2007). "Now Zimbabwe can see end of the road for its 'brutal old man'". The Guardian . London. Retrieved 4 May 2010. ↑ Evans, Ian (7 December 2007). "President leaves behind a people left paralysed by their poverty". The Independent . London. Archived from the original on 9 January 2008. Retrieved 4 May 2010. ↑ McGreal, Chris (2 October 2007). "Bakeries close their doors as collapse in wheat production adds to crisis". The Guardian . London. Retrieved 4 May 2010. ↑ "US Imposes Sanctions on 39 Zimbabweans". The Washington Post . 4 December 2007. Archived from the original on 4 November 2012. ↑ Castle, Stephen (9 December 2007). "Mugabe's Presence Hijacks European-African Meeting". The New York Times . Retrieved 4 May 2010. ↑ "Zimbabwe's opposition party claims early election lead", Associated Press (International Herald Tribune), 30 March 2008. ↑ "Zimbabwe presidential candidates confirmed" Archived 26 March 2008 at the Wayback Machine , AFP, 15 February 2008. ↑ "Mugabe accused of election-rigging plan", CNN, 23 March 2008. 1 2 MacDonald Dzirutwe, "Zim heads for run-off", Reuters (IOL), 2 May 2008. ↑ "Zimbabwe opposition rejects run-off" Archived 13 June 2008 at the Wayback Machine , Al Jazeera, 10 April 2008. ↑ "Runoff OK, says Zimbabwe ruling party". CNN. 4 April 2008. Archived from the original on 5 April 2008. Retrieved 4 April 2008. ↑ "Zim run-off set for June 27", Sapa-Associated Press (IOL), 16 May 2008. ↑ "Zimbabwe MDC never accepted run-off vote" Archived 10 May 2008 at the Wayback Machine , Al Jazeera, 10 May 2008. ↑ "Tsvangirai to run in second round", BBC News, 10 May 2008. ↑ "12 'violent' MDC supporters held: Africa: Zimbabwe: News24". Archived from the original on 27 May 2008. Retrieved 23 June 2008. ↑ Tendai Maphosa. "VOA News – Zimbabwe Sets Date for Runoff Amid Increasing Violence". Archived from the original on 19 May 2008. Retrieved 23 June 2008. ↑ Daily Mail Reporter (21 May 2008). "Mugabe tells Zimbabwe opposition: You are to blame for political violence after branding MDC 'evil'". Mail Online. London. Retrieved 23 June 2008. ↑ Angus Shaw, "Zimbabwe opposition leader pulling out of election", Associated Press, 22 June 2008. ↑ "UN impasse irks Zimbabwe opposition", Al Jazeera, 28 June 2008. ↑ "Mugabe begins new term as criticism of one-man election mounts" Archived 3 May 2011 at the Wayback Machine , AFP, 29 June 2008. ↑ "Zimbabwe: President Mugabe Wins Run-Off, Sworn in", The Zimbabwe Guardian (allAfrica.com), 29 June 2008. ↑ "President Sworn in, Appeals for Unity", The Herald (allAfrica.com), 30 June 2008. ↑ "UN move against Zimbabwe blocked", Al Jazeera, 28 June 2008. ↑ MACFARQUHAR, NEIL (14 May 1999). "2 Vetoes Quash U.N. Sanctions on Zimbabwe". New York Times. Retrieved 12 July 2008. ↑ United Nations Security Council Verbotim Report5933. S/PV/5933 page 7. 11 July 2008. Retrieved 14 July 2008. ↑ "African call for Zimbabwe unity". London: BBC News. 1 July 2008. Retrieved 1 July 2008. ↑ "Rivals sign Zimbabwe power-share deal". Edition.cnn.com. 16 September 2008. Retrieved 3 February 2011. ↑ "Zimbabwe power-sharing deal signed". MSNBC. 15 September 2008. Retrieved 3 February 2015. 1 2 "Government looking for land for mass burial, after killing 78 miners". SW Radio Africa via ZWnews. 11 December 2008. Archived from the original on 21 July 2010. Retrieved 12 December 2008. ↑ "Zimbabwe meets diamond trade standards", IRIN , 30 June 2010. ↑ McGreal, Chris (11 December 2008). "Bodies pile up as Mugabe wages war on diamond miners". guardian.co.uk. Retrieved 10 January 2009. ↑ Dixon, Robyn (4 December 2008). "Zimbabwe's deadly diamond fever". Los Angeles Times. Retrieved 12 December 2008. ↑ Dugger, Celia W. (31 January 2009). "Opposition Party to Join Zimbabwe's Government - NYTimes.com". The New York Times. Retrieved 4 May 2010. ↑ "Tsvangirai sworn in Zimbabwe PM". BBC News . London: BBC. 11 February 2009. Retrieved 11 February 2009. ↑ "Zimbabwe PM and wife 'in crash'". London: BBC News. 6 March 2009. Retrieved 6 March 2009. ↑ "Zimbabwe PM wife dies". Zimbabwe Metro News. 6 March 2009. Retrieved 6 March 2009. 1 2 3 4 5 "Bailing out bandits". The Economist. 420 (8997). 2016-07-09. pp. 43–44. ISSN 0013-0613 . Retrieved 2016-07-08. ↑ Ramzy, Austin (2017-11-15). "Zimbabwe's Apparent Coup: What We Know". The New York Times. ISSN 0362-4331 . Retrieved 2017-11-16. ↑ Moyo, Jeffrey; Onishi, Norimitsu (2017-11-15). "Robert Mugabe Under House Arrest as Rule Over Zimbabwe Teeters". The New York Times. ISSN 0362-4331 . Retrieved 2017-11-16. ↑ Johannesburg, Jan Raath and Harry Davies, Harare | Aislinn Laing (2017-11-16). "Mugabe crushed by his own strongman". The Times. ISSN 0140-0460 . Retrieved 2017-11-16. ↑ "Zimbabwe takeover 'seems like a coup'". BBC News. 2017-11-15. Retrieved 2017-11-16. ↑ Taylor, Adam (2017-11-15). "Analysis | Zimbabwe: When a coup is not a coup". Washington Post. ISSN 0190-8286 . Retrieved 2017-11-16. ↑ "Zimbabwe's Mnangagwa sworn in as president". RTÉ. 24 November 2017. Retrieved 24 November 2017. Zimbabwe’s Emmerson Mnangagwa has been sworn in as the country’s president, bringing the final curtain down on the 37-year rule of Robert Mugabe. ↑ "Violence flares over Zimbabwe poll". BBC News. 2018-08-01. Retrieved 2018-08-01. Wikimedia Commons has media related to History of Zimbabwe .